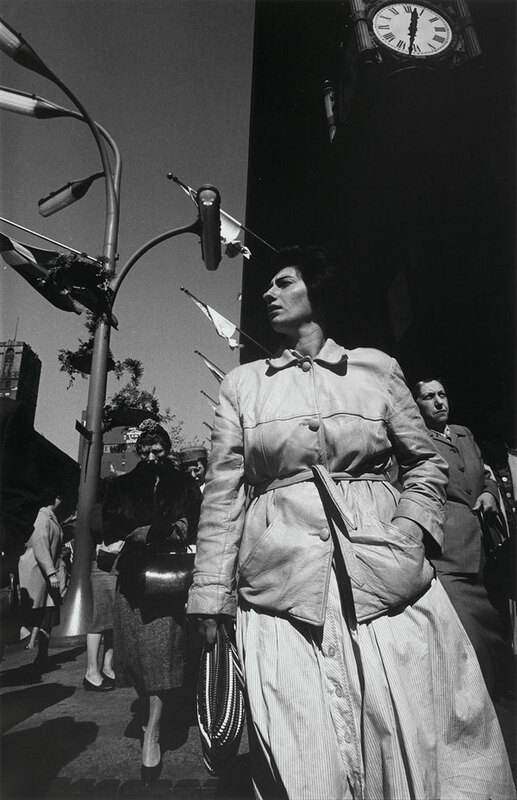 When I was ‘young in photography’ this Callahan photograph made a deep impression on me. A monumental figure like a statue is plucked out of an everyday moment on a footpath. 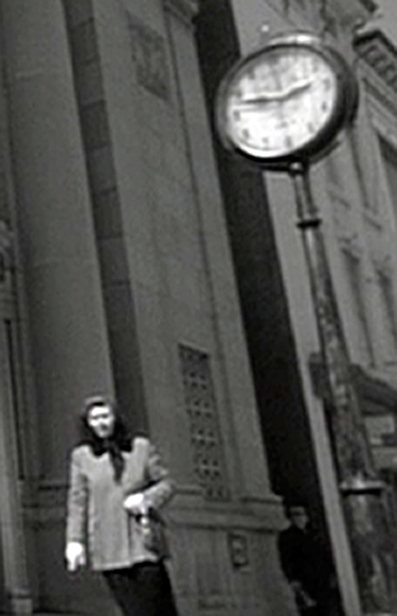 The ominous clock ticking away, its hand pointing at the woman, a de Chirico in Chicago. What are the odds against finding its sister image made only a year or two before? 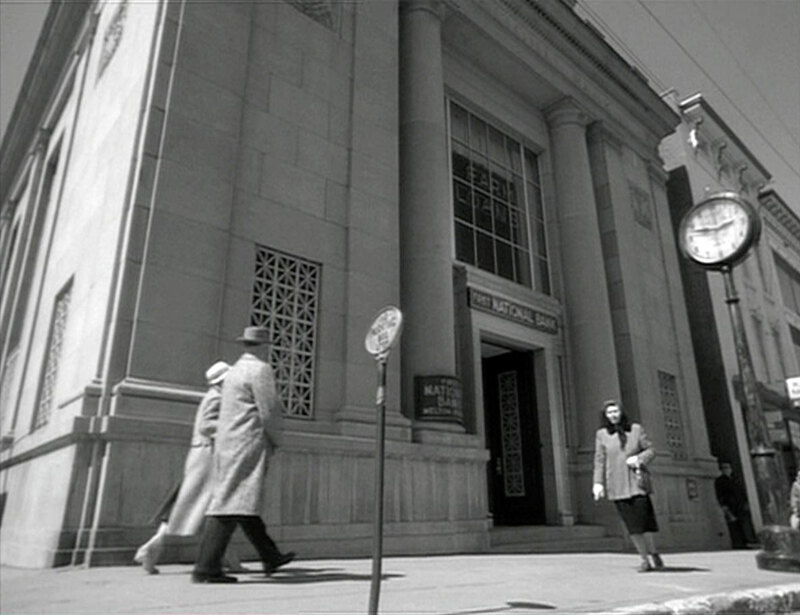 The Robert Wise movie Odds Against Tomorrow was made in 1959 and has a brief shot of people walking past a bank – soon to be robbed – and a woman walking under a clock. 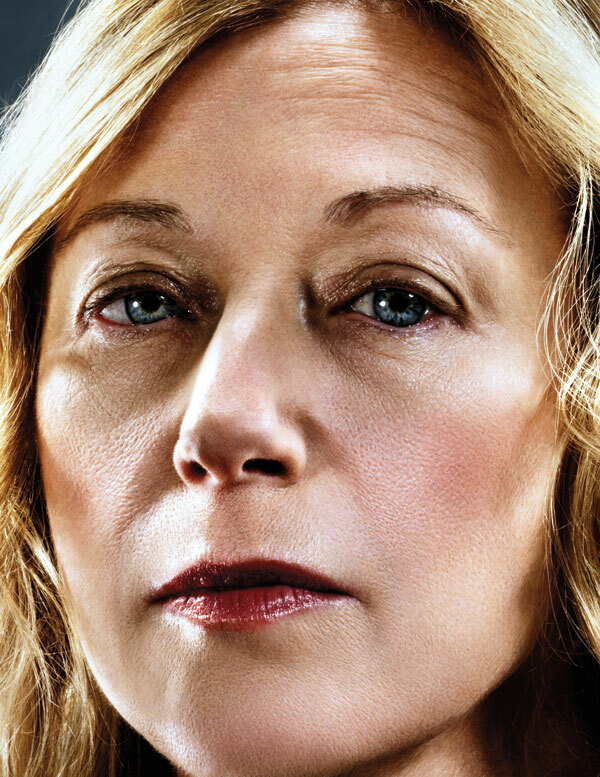 There are so many portraits of Cindy Sherman they are almost a genre of their own. A number of very good photographers have looked at her face to see what’s behind the many disguises she has worn over the past 37 years. She has not hidden away from them. Sherman is blessed with a mild and pleasant face that has no striking characteristics. What a stroke of luck for her that her ‘instrument’ matches so well the task she has set it – to carry hundreds of other identities. A more distinctive face would have made this impossible. It’s probably unique in contemporary art that a major artist has used her own face for a life’s work in this way – only screen actors come close. 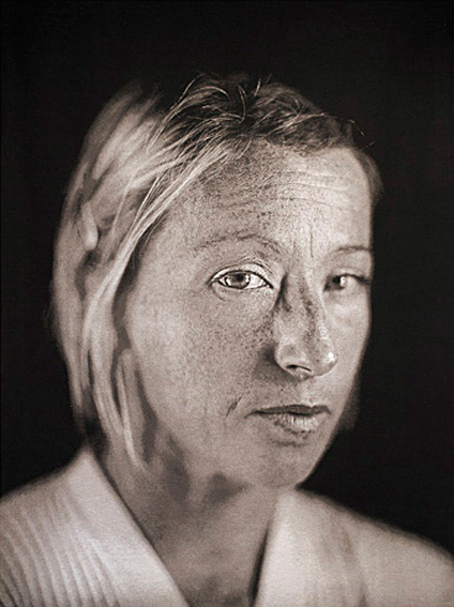 But do these portraits reveal anything? Sherman has said that when looking at her proofs, she is searching for the shot that is not her, where the identity portrayed is the fictional subject she is trying to create. In her artworks she acts out identities, it’s not just makeup and costume. She creates those characters from the inside. Look again at these portraits. Don’t they have a guileless quality? There is no performance in them as there so often is in portraits, but even in snapshots. It’s as though the years of externalizing her inner characters have drained the vanity from her and she can present herself to the camera as herself. 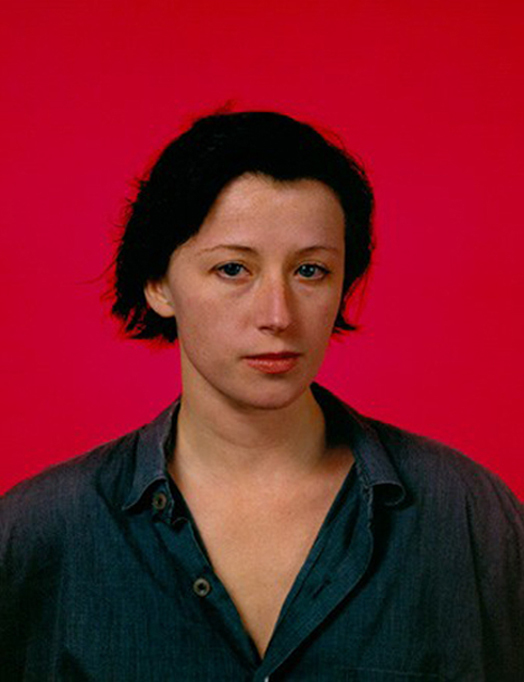 When Cindy Sherman was starting out in the 1970s she worked on the front desk at Artists Space gallery in New York. She would appear dressed up in costume from her shoots. The fact that she would sometimes show up for work dressed as, say, a nurse, or in a pinkish suit à la Jackie Kennedy, but frumpier, with cat-eye glasses on, is now part of art-world lore. This portrait of Sherman in her Lower Manhattan studio is by Annie Liebovitz. The curious over exposure seems to play on Sherman’s invisibility behind the masks of her staged characters. 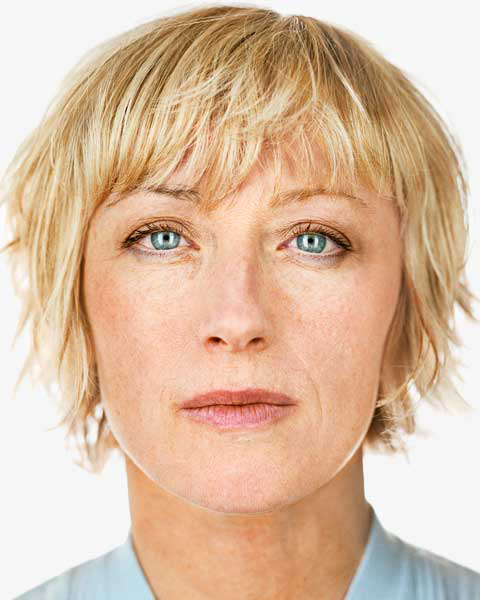 Since she has always photographed herself the question of the real Cindy Sherman has been an issue. Liebovitz once portrayed her in Vanity Fair surrounded by lookalikes – see below. She even describes people being disappointed when meeting her since she is so mild-mannered compared to her extremist characters. Sherman has a retrospective at MoMA this year and Vanity Fair online has a background article about it. 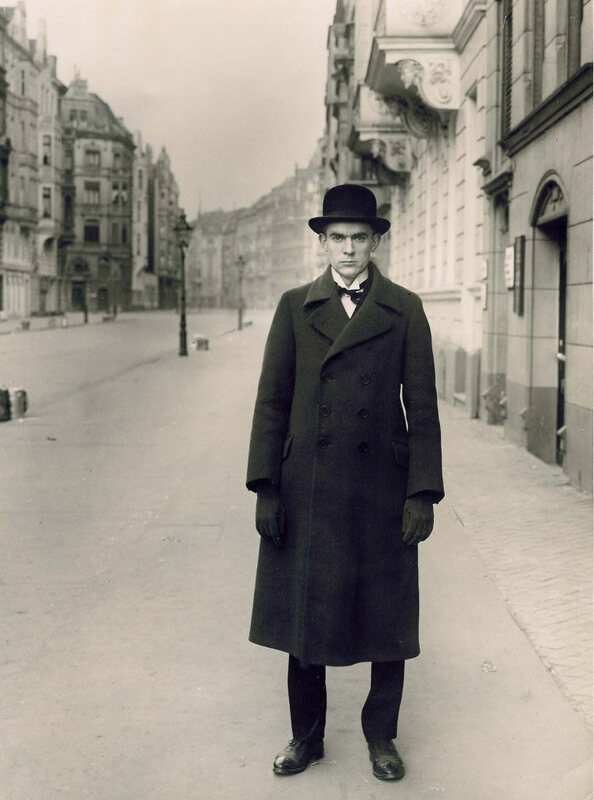 The NGV‘s recent Mad Square exhibition of Weimar art included the August Sander photograph above. It is a portrait of the painter Anton Räderscheidt, photographed on the Bismarckstrasse in Cologne. 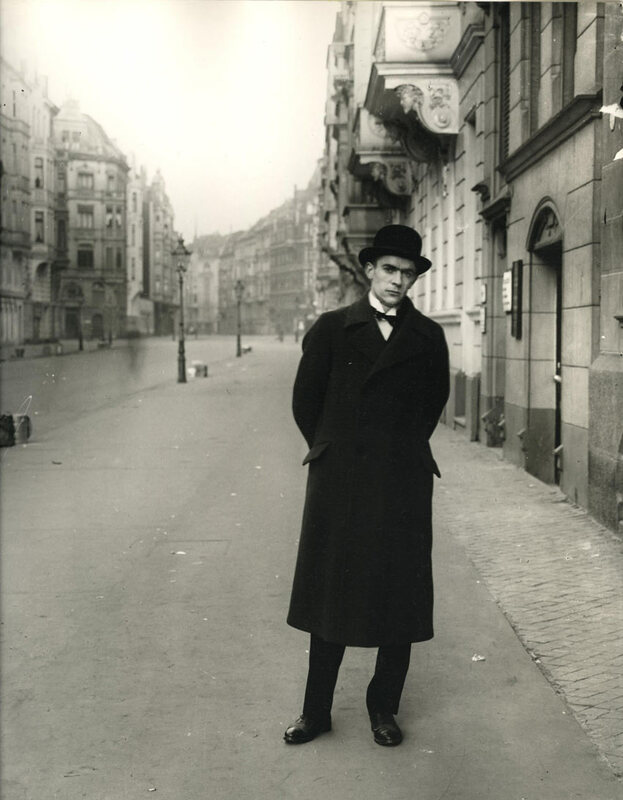 Shot at six in the morning when the street was empty of people, Räderscheidt is dressed in his usual attire, looking like a figure from one of his own paintings. 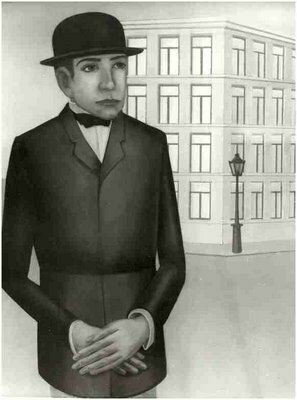 In the 1920s and 30s, Räderscheidt painted in the New Objectivity mode, shading off into Magic Realism: bowler-hatted figures encounter modern buildings, and naked women, in airless streetscapes. The photograph has always seemed strangely blunt to me – the subject faces the camera without guile or grace, like a court exhibit. There is something about the legs which reinforces the object-quality of the figure, as though he is a table rather than a person. 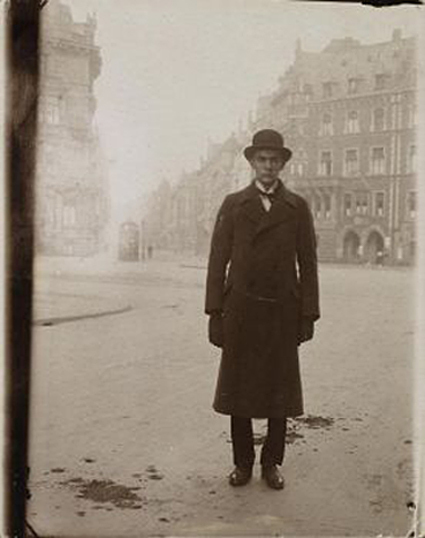 Two variant images have surfaced, one shows the subject in a more relaxed pose, and another where he stands amid horse droppings – well it was the Weimar period. Räderscheidt had a long career as a painter. Successful in the Weimar period, he became an official Degenerate artist in the Nazi period and left Germany, but he survived into old age with some renown. His paintings, which can be seen at www.raederscheidt.com, showed solitary figures in empty, alien streets, just like Sander’s photograph. Melbourne’s new photography gallery, Edmund Pearce (Edmund who?) 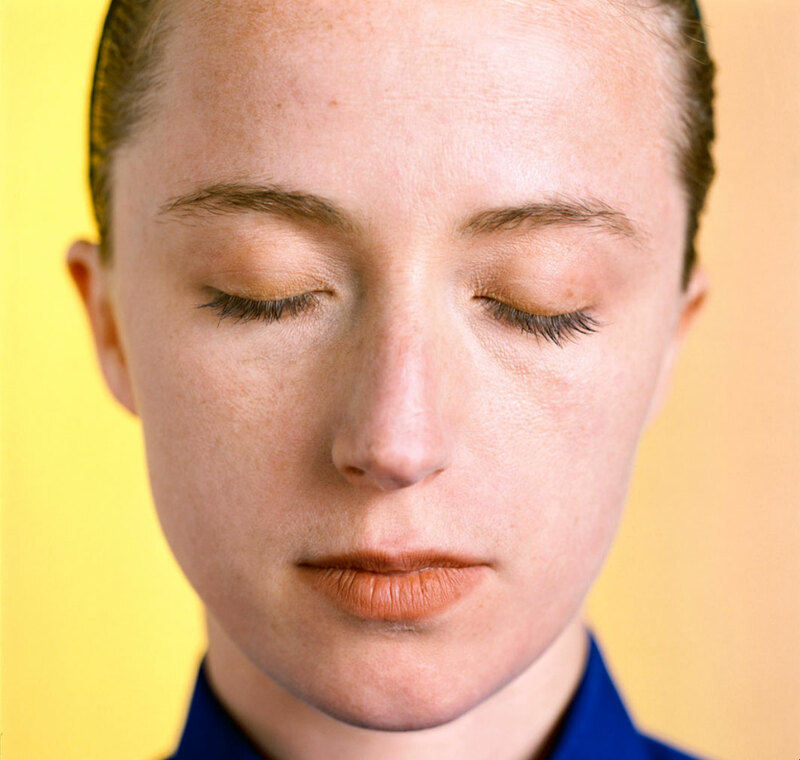 has had a group show that included the work of Katrin Koenning, an emigré German photographer who lives in the city. Her work can be viewed on her excellent website www.katrinkoenning.com. The images may remind you of Lorca diCorcia‘s urban photos, I can’t argue with that, although he in turn might have have once been compared to Harry Callahan who also shot in big city canyons. 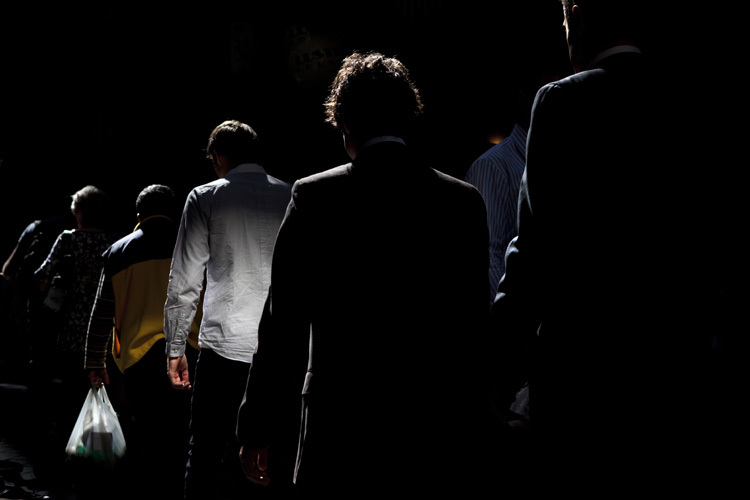 Koenning has found a Melbourne city street where light penetrates only briefly during the day like a spotlight. Passers by are caught like actors on a stage, and Koenning’s long lens draws out the drama with great precision. The image below looks like a stage version of Dante’s Inferno. Phillip Toledano is an enterprising photographer from the U.S. I recently posted about his satirical project America, the Gift Shop. 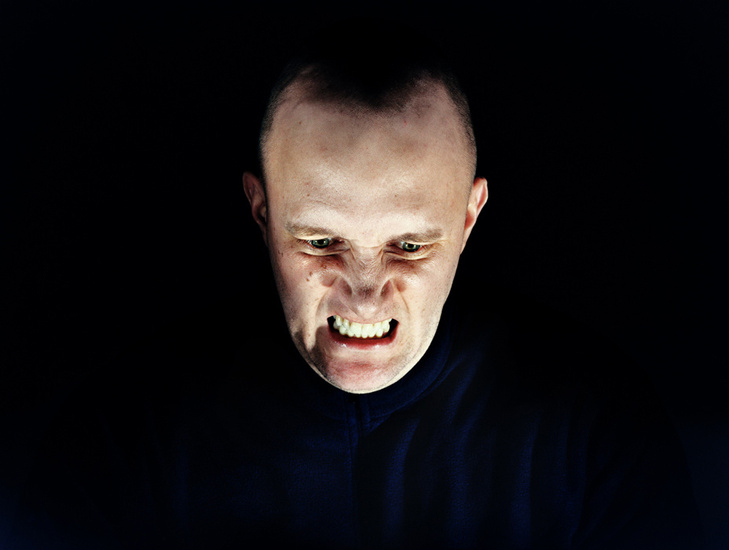 The startling image above is from a series on emotion and facial expression. It looks like someone inflicting pain, or receiving it. Could it have been shot in a gym, where pain is the currency? Or perhaps an acting class, with students performing scenes of violence? These are all good ideas and I should follow them up with my camera, since I’m interested in representations of the face. But they are not how Toledano captured the image, one of a series of intense portraits of emotion which you can see it at www.mrtoledano.com.